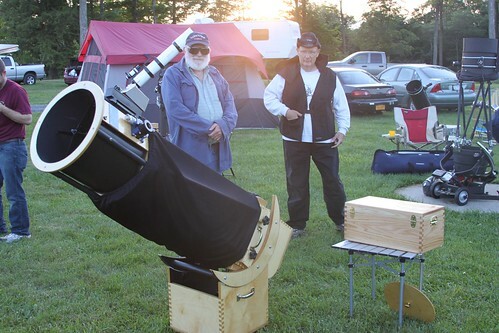 The 2013 Cherry Springs Star Party was conducted this past weekend from June 6 – 8, and many members from the KAS participated. One KAS member arrived early to Cherry Springs State Park located in the northern tier of PA, to catch a chance at amazing skies earlier in the week. There was some success in this attempt, and scored two observable nights under the Cherry Springs dark skies on Tuesday and Wednesday. Thursday was mostly rainy and about 4-5 KAS members gathered to enjoy each other’s company while waiting for the Friday activities to start. On Friday, more KAS members showed up, and began to form the KAS encampment at the event. Vendors setup under a large tent including Skies Unlimited, Hands on Optics, Astro Gizomos, and others. Syracuse based member, Ryan Goodson, also set up one of his self built New Moon Telescopes in the vendor tent, and discussed the features of his design, hosted demos, etc.. Starting early Friday afternoon, various presentations were held including one given by Bob Naeye, Editor in Chief of Sky & Telescope Magazine who did a history of time presentation entitled “The Origin of Everything.” A fantastic presentation discussing everything from the Big Bang to the modern civilization we are in today. Other topics included technical discussions of telescope features and maintenance, and a presentation by Larry McHenry regarding the 2012 Venus Transit. Unfortunately, the skies remained covered by clouds and misting rain throughout Friday night. But the KAS members had a great time hanging out with one another, sharing a great meal, and discussing a wide range of science based topics. Saturday again offered chances to purchase product from and interact with vendors, and provided a wide range of discussions on a variety of topics. More KAS members arrived as the day progressed with the prospect of a possible clearing Saturday night. Great presentations ran all day again, and as the day progressed the sky slowly started to clear up. By 8:30 PM, the sky was mostly clear with large patches of clouds rolling through occasionally, and by 10:30 PM or so, the sky was clear the remainder of the night. There’s just not much that is better in amateur astronomy than a clear sky at Cherry Springs State Park. A really amazing experience that someday I hope I can find a way to express in words. Saturn was first found around 8:20 PM, and for a period of about 2 hours, the KAS entertained between 30 – 50 people from the general public who were not there to attend the star party. It has always been a major component of the KAS mission to offer public outreach support such as this. The vast majority of the group was observing until 2 in the morning, and everyone finally concluded their viewing by 3:30 in the AM. A great experience that was well worth the wait. Those who roughed out the rain had a high yield payback in the single night of observing. The core of the group observed together for about 4-5 hours sharing telescopes, eye pieces and views. 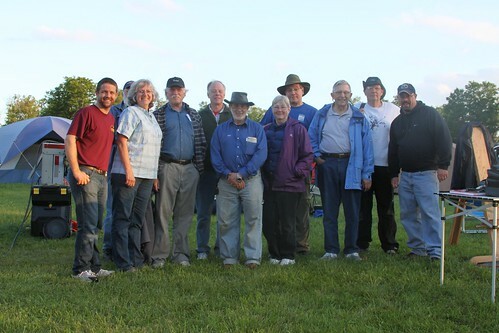 This was our most successful outing as a club to Cherry Springs with a record number of members joining us at this great observing location this year. All that attended had a fantastic time, enjoyed great lectures, obtained amazing deals with the vendors, and were able to enjoy one wonderful night of observing. Next up for field trips will be the Stelafane Amateur Telescope Makers convention in August.